Another great weekend of racing. 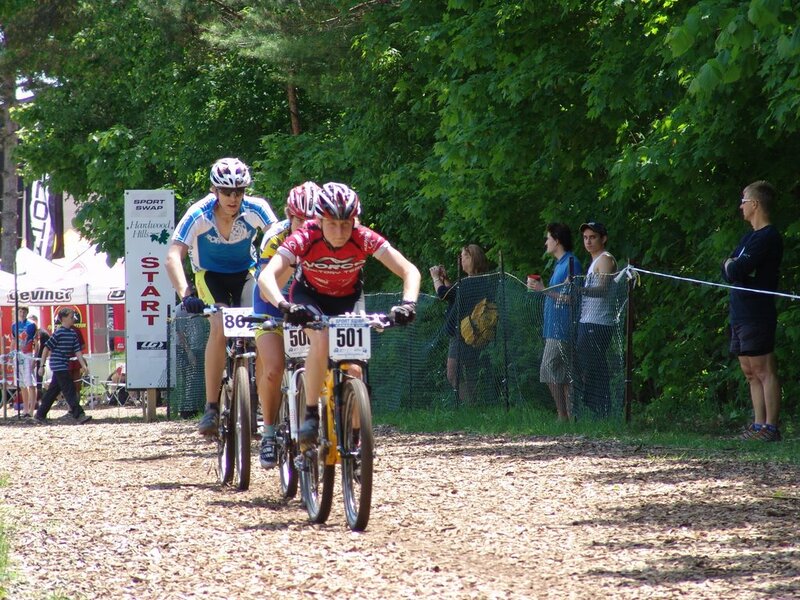 The normal group of Canada Cup girls got lucky this weekend, having the opportunity to race two of Canada’s best mountain bikers Kiara Bisaro and Marie-Helene Premont. Faster racers always bring another dynamic to the race and help the regulars reach for greater racing potential. This weekend I was hoping to go hard first lap and put some distance between me and my competitors as I did last week. But as I said faster riders change race dynamics. The start was hard and I found myself in a position I wasn’t happy with, trying to bridge a gap to catch the faster starters. I was able to do it before the single track and entered the woods with only Marie and Kiara in front of me (as memory serves;-). The course was a lot of fun. We twisted through pine forests and over undulating terrain. I went out hard and found myself riding with Kiara with Mical 10-15 seconds off of us; A little too close for comfort. I knew my strength was in the first half off the race so whenever I got the chance to lead I went to the front and hammered. But today was not the day. Mical was not to be dropped, nor Kiara. Marie had been putting about 30-45 seconds into us a lap. Midway lap 3 was my undoing. Kiara got by me first on a climb while I refueled and I didn’t immediately try to cover the move. She opened a good gap, but I was still in third. Then was the sound it’s always tough to hear late in a race, the sound of your competition breathing hard down your neck. You know the attack is coming soon. Mical attacked on an open stretch between two sections of single track. I tried to follow, but my legs didn’t want to respond. From then on it was all about how fast I could motivate myself to go. Unfortunately, not hard enough. I lost gobs of time that last lap by giving into my body’s desire to slow down. I did hold on to 4th but lost too much time. Mical went on to catch Kiara and finish 2nd only 2:30 off Marie Helene. A very impressive ride. Jaqulin Mourao of Brazil finished 5th.